Foto Friday XCVIII – ..:: NJ Brideau ::..
I’m not sure if this counts as a Foto Friday or not – it isn’t my picture. I haven’t had the energy to go through all my beautiful pictures from Iceland, or make any of the adjustments that I planned to some shots of Oxford. Nope. For this week’s edition of Foto Friday I went to the cupboard that I have of reserve pictures in case I need something to show. This is a picture that Mafalda took last spring here in Oxford. She had originally asked me to show how I use the content-aware fill in Photoshop in order to remove a wire, and then suggested that this might look nice with everything black and white except for the girl and her bright colors. And there you have it. I might have to technology but I still need to find the eye for photography. 1/640s f/4.0 15.7mm ISO 80. 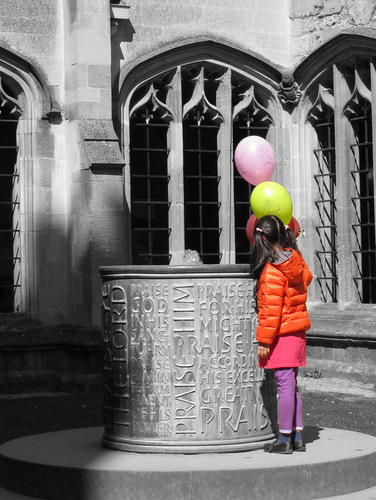 Selective coloring and cropping. Au revoir until next week. You also need some sleep before writing things in English but I really liked this surprise. Thanks! 🙂 I like the final result a lot!